Happy Heart Kid’s mission is to inspire, engage and empower families with character building activities through play. I was beyond myself to have been granted the opportunity to review this wonderful kit especially since it was something that I wanted to try out with little one’s Spanish playgroup. The children were super excited to try out all of the activities. I was impressed with the quality of the materials included, and how each activity was thoughtfully planned out. For busy parents, this is a plus! I truly enjoyed the “parents guide” to help us with thought provoking ideas, and suggestions to help our children during the activities. On the cover of each activity booklet you will see various symbols of skills required or that can be acquired for each one; such as a paint palette symbol and the word “Artistic” or a bubble symbol and the word “Cognitive” for the activity book on Empathy it’s a story, and coloring book as well. The main character for the Happy Heart Kid’s kits is Caleb. In our empathy packet we read the “Activity Book – Empathy.” It’s short story on Caleb the main character and how he felt when someone was rude to him in the playground, and it’s also a coloring book. For our Spanish playgroup we did the Activity Book, and then I read to the children in English, and translated into Spanish at the same time. For the Imaginative Play I pulled out a white board, and drew different faces. We did the “feelings and faces” activity (per the parent’s guide). I loved how the children took their time to think about their feelings for each scenario. For Connect and Share the children made the felt flowers, and I asked them who were they going to give the flower to. One of them said she’d give it to her mommy, the other one to her uncle, and my son said he’d give it to me. I thought it was sweet on how thoughtful they were. The Create and Explore has been my child’s prized treasure. He loves to read it the empathy placard, and displays it in his room. As parents we have so many responsibilities, and we’re always on the go… so when do we carve out good quality time with our children? 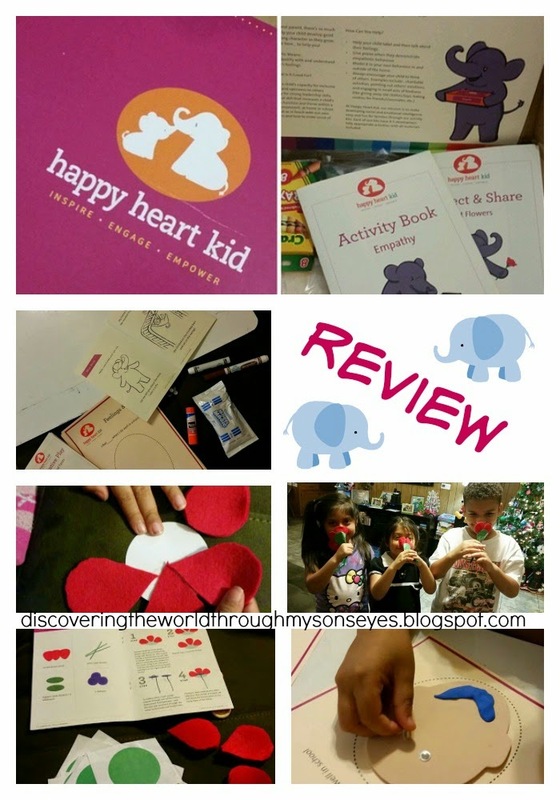 Happy Heart Kid provides the tools that you’ll need to help you engage, inspire, and empower your child with hands-on activities. Support Happy Heart Kid through their Kickstarter campaign, and helping them reach more homes with their beautiful character building activities!